PLEASE NOTE: There is a lack of supplemental images in this review due to there being no production stills of Design for Murder available. ID Plays’ Summer Season 2014 at the Wolverhampton Grand continues this week with Design for Murder, a self-proclaimed ‘psychological drama’ as opposed to the more atypical murder mystery mould it’s title may first evoke. After a mixed audience and critical response to the season’s first show, Ladies in Retirement, it is encouraging to see ID springing back to form with a cracking, twisty-turny evening of drama, intrigue and even the odd giggle. Design for Murder may not be anything the estates of Conan Doyle or Christie need worry about, but it is nonetheless a consummately entertaining piece of theatre that is genuinely intelligent in places, has the decency to not take itself too seriously and offers enough U-turns and revelations to keep even the most ardent Marple enthusiast second guessing right up until the end. Despite not being, as mentioned, a conventional murder mystery, Design certainly borrows one of it’s most immediate and obvious tropes - being set entirely in the living room of characters Moira (Carly Nickson) and Clive Richards (Paul Lavers). The Richards’ estranged marriage is seemingly at breaking point - bored, unhappy yet dependent Moira is continually trying her hand at new artistic outlets - her latest being an expressionist painting that looks akin to a Van Gogh interpretation of the digestive system. Unimpressed yet defeated, husband Clive spends his days pottering around in the garden and making financial cutbacks even as smarmy business partner Philip (former Emmerdale star Peter Amory) seems to contrarily be on quite the upturn, whilst simultaneously showing a rather intimate interest in Moira. Into this awkward and tense dynamic comes an offer of a buyout for Clive and Philip’s business, which ultimately serves as the catalyst for a tangled series of betrayals, double-crosses, plotting and, of course, murder. Eschewing a traditional ‘whodunnit’ approach, Design instead focuses on the growing animosity and tension amongst it’s core trio of characters, something which is only heightened when Bridget Lambert’s character arrives and her allegiances and even identity immediately fall under question, to both the characters and indeed the audience. The growing distrust and backstabbing creates something of a palpable sense of tension and suspense, especially given the shows title, as each skeleton in the closet or proposal of betrayal ratchets up the uncertainty of exactly where it is all heading and who, if anybody, will be left standing by the end. The first Act does a terrific job of establishing the surprisingly nuanced relationships (particularly Moira and Clive) and offers shades of duplicity and misdirection, but it is in the second where Design goes all out in it’s back and forthing and surprises. It is here that the show sacrifices a lot of its pretense of realism - characters bandy about talking of murder and plotting to kill as lightly and inconsequentially as though they were devising a shopping list, and by the end some of the characters are given foresight and cunning of almost evil genius levels - but despite the increased absurdity and suspension of disbelief, it’s a genuinely thoroughly entertaining romp that, crucially, keeps plenty of aces in play and had this mystery veteran surprised and doubting himself even as the final curtain fell. The cast assembled do a solid job, with Carly Nickson’s somewhat infantile, bratty turn as Moira a highlight throughout. Peter Amory makes Philip suitably lecherous and dubious, and Paul Lavers recovered from a wobbly start to eventually make Clive very possibly the show’s most interesting, unpredictable and layered character. Bridget Lambert’s character is perhaps the least realised and developed, but Lambert should be applauded for always keeping her inscrutable to the point of suspicion. Writer Donald F East and Producer-Director Ian Dickens have come up trumps with Design for Murder, and anybody with a passing interest in this ilk of mystery/suspense drama should most definitely check it out. It is one of very few shows where the arrival of the interval felt like an unwanted intrusion and had me wishing I could head straight into Act Two - being genuinely invested in the plot and characters and wanting to know what transpires next. Yes, it’s more than a little silly in places, and at times the characters and writing threaten to paddle into realms of caricature and parody, but only in the vein of, say, Midsommer Murders or some of the woolier Poirot or Marple’s, so by that pedigree and benchmark it’s target audience should find a great deal to enjoy and appreciate in this surprisingly complicated and thoroughly satisfying foray into the mentality of murder. 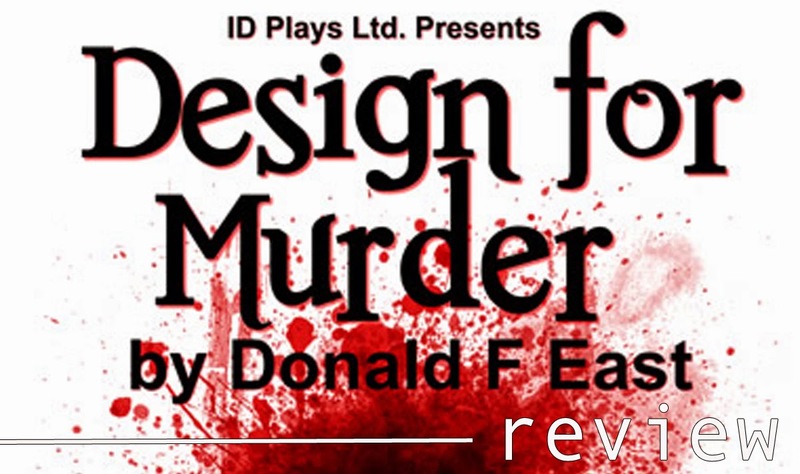 DESIGN FOR MURDER is running at the Wolverhampton Grand Theatre from Tuesday 17 to Saturday 21 June 2014. CLICK HERE for more information on the show's run at the Wolverhampton Grand and to book your tickets! Alternatively, telephone the Box Office directly on 01902 42 92 12. For more news, updates and exclusive content from (A)musings, be sure to 'like' our Facebook page and follow Kyle on Twitter! Press tickets for this performance of Design for Murder were provided courtesy of the Wolverhampton Grand Theatre directly. (A)musings Media gratefully acknowledges their generous invitation and support. Welcome to the (A)musings blog! Established in 2012, (A)musings is all about bringing high-quality reviews, news and features covering the worlds of Entertainment & Culture! Why not visit our brand new website, and the successor to (A)musings over at www.nueditorial.com! STAR WARS EPISODES 7-9 ANNOUNCED! - A Great Disturbance in the Force? STAR WARS EPISODES 7 - 9 ANNOUNCED! - A Great Disturbance in the Force? All original content copyright © Amusings Media 2012 - 2017. Awesome Inc. theme. Theme images by MadCircles. Powered by Blogger.